(2) Battery chargers for camcorders, laptop computers, cellular phones and power tools. (3) Ideal for camping, boating, caravans, mobile office field work, emergency power and many other uses. (4) Over 600W effect in high motor starting surge and can be used for hand tools, small refrigerator and most oxygen concentrators. 1. 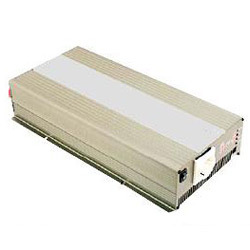 Output power continuous 15 minutes surge: 150W and 300W. 2. Output voltage: 115V+/-3% and 230V+/-3%. 3. Output frequency: 50 or 60 HZ. 4. Output wave form: pure sine wave. 5. Total harmonic distortion: ＜3％. 6. Input voltage range: (1) 12 volt: 10.5V-15V. (2) 24 volt: 21V-30V. 8. No load current draw: (1) 115V-12V: ＜0.5A. (2) 115V-24V: ＜0.4A. (3) 230V-12V: ＜0.5A. (4) 230V-24V: ＜0.4A. 9. Low battery alarm: (1) 12 volt: 10.5V. (2) 24 volt: 21V. 10. Low battery shutdown: (1) 12 volt: 10V. (2) 24 volt: 20V. 11. Dimension (LxWxH) (mm): 120x147x66.